Buying a home can sometimes feel rather overwhelming. Once you have finally found your home, you then need to deal with all those extra fees you incur, which are referred to as closing costs. These costs can really add up. These are only a few of the closing costs that may be involved when purchasing your home. Please don’t hesitate to get in touch with us for more information and to schedule your home inspection. ​There’s a new addition to the family… and you want to protect them the best way you can. In order to do this, a necessary check of the crib will make sure your baby remains safe at home. But what are you looking for? Any screws or bolts that may be missing, or pieces of the crib that looks to be missing. Also, the mattress the baby is using must be firm and fit snug in the crib to prevent the baby from getting stuck in between the crib and mattress. Having your baby in a sleeper and not in a blanket can reduce the risk of suffocation. Blankets, pillows, comforters, or quilts can also cause your baby to overheat easily, so removing these from your babies crib will reduce the risks of overheating and potential suffocation. 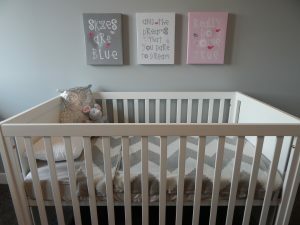 Over 2 million cribs in the past ten years in the U.S. alone have been recalled due to defects and flaws in the design. Making sure that your babies crib is safe and secure can further help you to protect your baby from harm. When you hire Hero Inspection Services, you get WAY more than a home inspection - because we are WAY more than your average home inspectors. We are your premier home inspectors in the greater Orlando area. We provide the best home inspections in the area by having more experience, more training, and a better understanding of your needs. We have built experience through years of construction. This is invaluable to our process, as it gives us insight into houses in the area that help us find issues, understand them, and then help you to understand them as well. We are InterNACHI Certified Professional Home Inspectors, a Certified Master Inspector, Stucco Certified, Sewer Camera Certified, . This means we have gone the extra mile to obtain more training, hold ourselves to a higher Code of Ethics, and to use a more detailed Standards of Practice – all to give you the best inspection services possible. We know that you will find what you are looking for here at Hero Inspection Services. So contact us today to schedule YOUR comprehensive home inspection. How much will it cost to repair my home? ​The Repair Estimates Report is a fast and accurate report with guaranteed pricing through Porch. The Repair Estimates Report has detailed quotes, for every item in the report by General Contractors and team of experts. The standard delivery timeline is less than 48 hours and customers can upgrade to rush delivery (6 hours). Porch will also provide customer service and personal follow-up from the Estimating Specialist who prepared the report to answer any questions that your clients may have. What else is included in the Ultimate Hero Package? 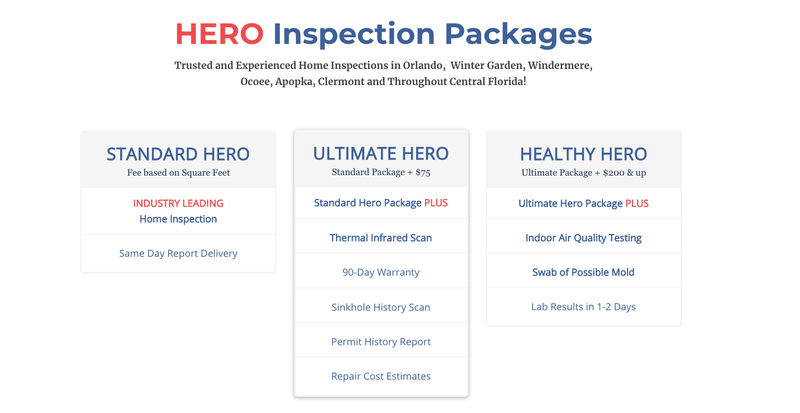 Homebuyers can upgrade their inspection package to the Ultimate Hero Package for $75. Besides an Industry Leading Home Inspection with Same Day Report Delivery, Homebuyers receive a Thermal Infrared Scan, 90-Day Warranty, Sinkhole History Scan, Permit History Report and The Repair Estimates Report.